The general consensus after Hertha Berlin held VfL Wolfsburg to a 1-1 draw at the Olympiastadion was that a point apiece was a fair outcome. 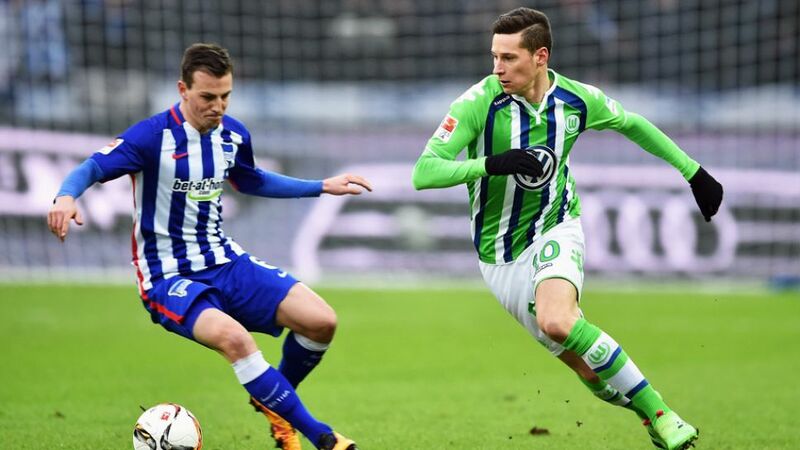 Julian Draxler (Wolfsburg midfielder): "I think if you look at how the game went then a draw is probably a fair result. If you look at the table, though, then it would have been great to have taken three points today. Unfortunately we didn't manage that, but at least we didn't lose against a tough opponent. We were still slightly feeling the effects of Wednesday [in the UEFA Champions League] and we have some injury problems so there is less of an opportunity to freshen things up." Naldo (Wolfsburg defender): "I think we fought well in the first half, but didn't play well enough going forward. The coach told us that we needed to attack at more pace in the second period. We created chances and made it 1-0 but they replied five minutes or so later. With a little but more luck, we would have taken the victory today. We'll keep our heads up, though, because we're on the right track." Salomon Kalou (Hertha forward): "I think after coming back from injury it's always good for your confidence to score. It's a pity that we couldn't win today but Wolfsburg are a good team and taking a 1-1 against this kind of team is a fair result." Dieter Hecking (Wolfsburg head coach): "The bottom line is that, based on the performances, it deserved to end in a draw. In the first half we saw a game that was defined by the each side's tactics. We allowed ourselves to make two or three mistakes too many that Hertha capitalised on. In the second half both teams pushed forward more, there was more space left in behind and we took advantage to put ourselves in front. I hoped we would have held onto the lead longer. In the closing stages we could have potentially even scored the winner. [Rune] Jarstein did exceptionally well to keep Hertha in the game." Pal Dardai (Hertha head coach): "In the first half we controlled the game well against a top side and, had we taken the lead during that period, we could have perhaps caused an upset. Our aim is to be able to go toe-to-toe with top teams such as Wolfsburg. Of course I also have to praise our goalkeeper Rune Jarstein. We tried to play for the win, because we didn't want to drag out this run of draws any longer."